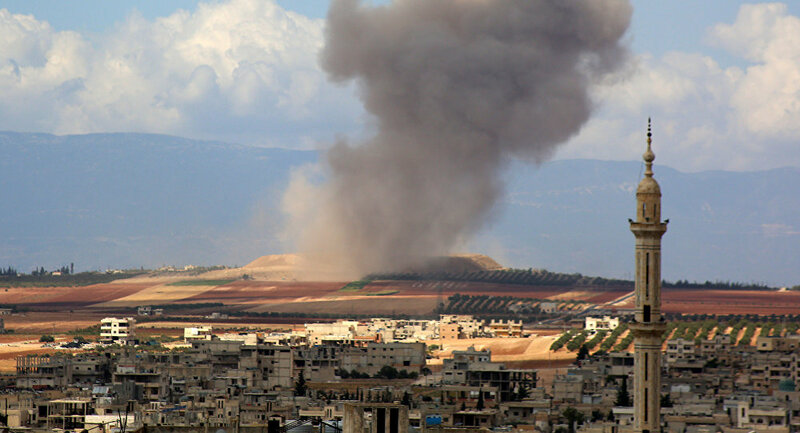 Militants in Idlib are filming a staged provocation depicting chemical weapons being used by the Syrian army against civilians, according to the Russian Center for Syrian Reconciliation, which cited information received from inhabitants of Idlib province. Sputnik discussed this with Chris Kanthan, a San-Fransisco based political analyst and author of the book "Deconstructing the Syrian War." Sputnik: What do you make of what is going on in Syria right now, particularly in Idlib? Chris Kanthan: It’s really dangerous that's the first point, and it’s dangerous because there are Russian troops in Syria. Even during the Cold War, the US never engaged in a direct confrontation with the Soviet Union; we don’t want to start that now. The second point is any strike by the US and its allies such as the UK or France will be totally illegal. The US has no right to be the judge and the prosecutor. Worst of all, the whole situation is ridiculous when you consider the fact that the US and the allies armed and funded the jihadists for seven years and now the same people are crying crocodile tears for the civilians. Any logical person would know that if there is a chemical attack, it is a false flag attack staged by the White Helmets, who are funded by the West. Sputnik: Who’s telling the truth and how can you make sense of this when both sides [Russian and US] are saying: 'Yes, it’s a false flag attack' and 'yes, they always announce it ahead of time to make it look like a false flag attack'? People are just completely bombarded by this, I think that even in Syria there are sides that have very contrasting points of view on who is responsible for what. Chris Kanthan: First of all we have to think who is to benefit from a chemical attack. So from Bashar al Assad's point of view, he is winning; after seven years of war he has basically won the proxy war that’s being waged on Syria. The only group to benefit from such an attack are the jihadists, right? Because they’re losing the war and the only way that they could get help from the US, the UK and France etc. is to say: “Hey, look there is a chemical attack.” So that’s the first thing that we have to realize. It’s like watching a soccer game, the team that’s losing the match is the one that’s going to do the foul and they are going to fall down, and they are going to try to blame the other team so that the other team gets the red flag. So if you look at the last seven years, you see what happened, right? The US, Saudi Arabia, Qatar and Israel, they all supported Al-Qaeda and ISIS* and so on. And these guys were sent into Syria through Jordan and Turkey, and even if you look back at some of the Wikileaks emails, you see that Hillary Clinton got an email saying: “The Al-Qaeda is with us.” So we know what's happened, it is the same thing that happened in Afghanistan in the 1980s. In order to attack the Soviet Union the US helped the mujahideen and they used Pakistan as the staging area. Fast forward to the last seven years, the US and the allies, they brought in the same Al-Qaeda team but the new version called ISIS and they used Jordan and Turkey as the staging area to send in the terrorists and the weapons.